One of the worst fears of any analyst or broker is turning bullish right at the top, or turning bearish right at the bottom. Believe me, just the thought of it gives all of us nightmares, and causes us to awaken in a cold sweat, screaming like we were Jim Cramer. 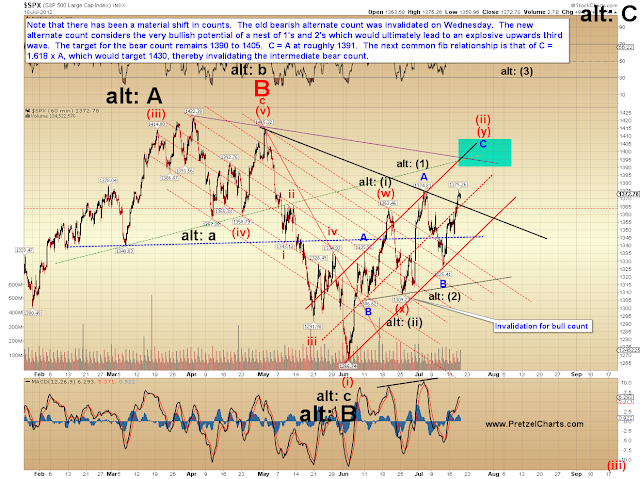 So before we go further, let me state for the record that I am not turning bullish -- yet. 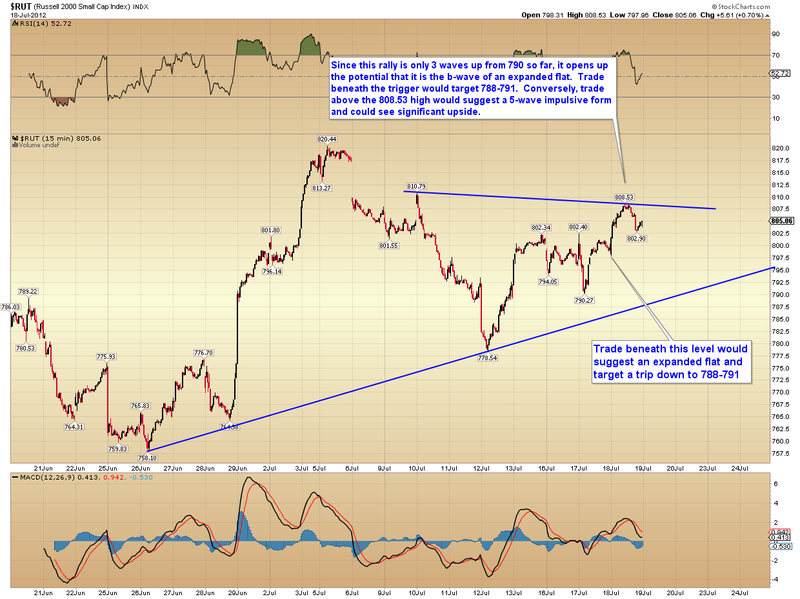 However, the charts are starting to display a number of potentially bullish breakouts that simply shouldn't be ignored. Now, the rally has played out more or less as I've been expecting for the past month and thus clearly still fits the criteria of the intermediate bear view. It would be silly of me to suddenly turn bullish here, when the market has done essentially what I thought it would. But, as I've said before, the reality of the market is all about potentials and probabilities. And the reality of analysis is that the charts only allow us to see a certain distance down the road. In any case, the potential is simple: if the bears can't make a stand where they need to, then this becomes an extremely bullish pattern. 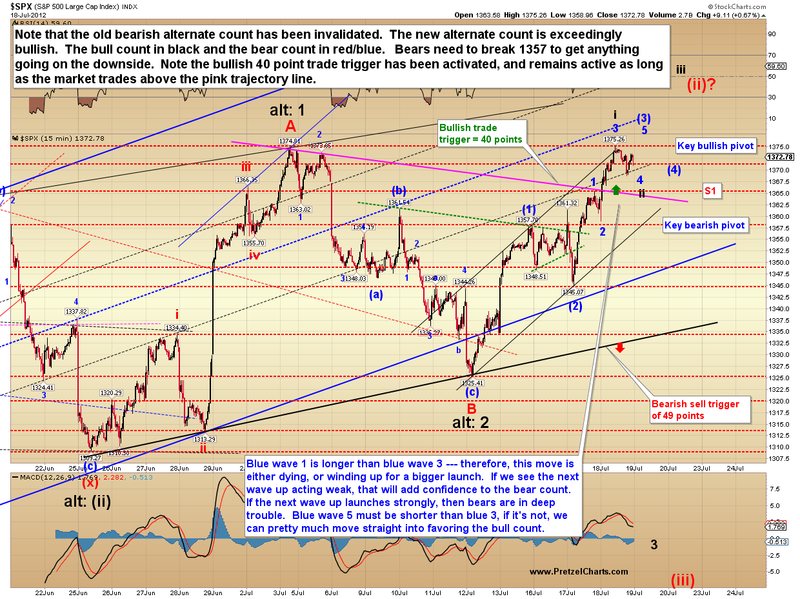 The alternate bearish short-term count was invalidated yesterday (and, thankfully, so was the triangle!) -- so this leaves the preferred count as, effectively, the bears' last (decent probability) hope. 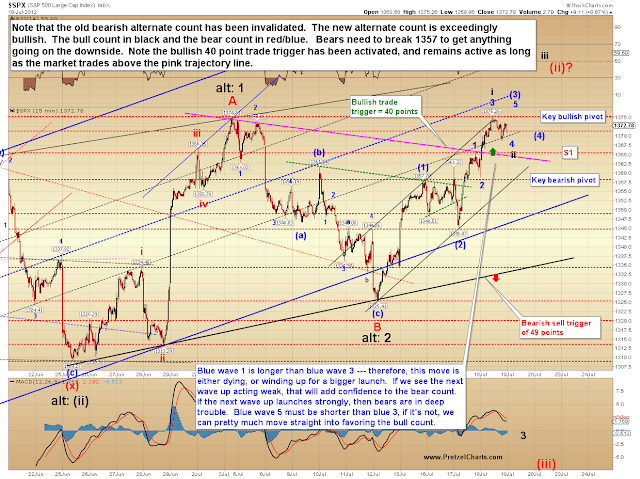 The preferred count has been anticipating a rally up toward the 1390's, and that appears to be unfolding. What happens over the next few weeks is very likely going to determine direction for many months to come. 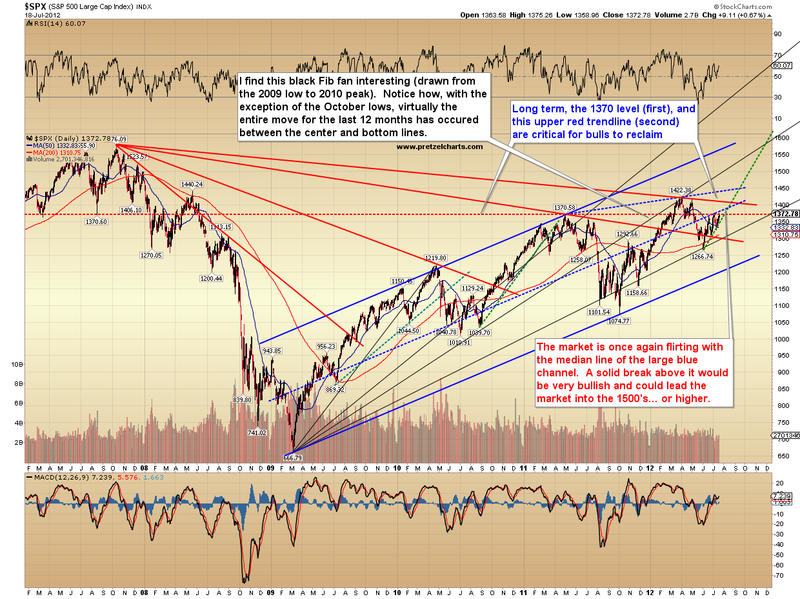 If the bears make a stand in the near future, then an ugly decline awaits. If they don't, then it's off to the races. It's currently unlikely that there's an "in-between" option, but as always, the market reserves the right to alter that outlook. If the decline shows up, then bulls will come up with reasons to buy into it the whole way down. 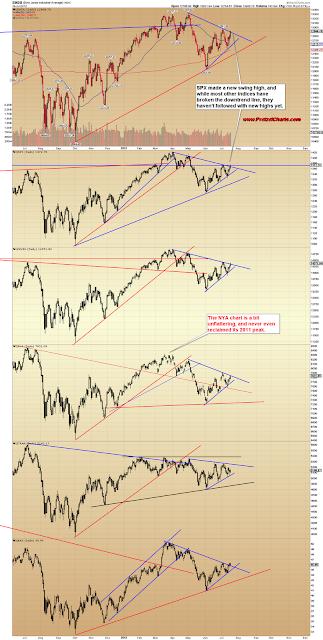 Conversely, if the rally shows up, then bears will keep pointing to something ugly (and there's lots of ugly!) and short into the teeth of it the whole way up. I don't wish to be either one of those traders, and neither do you. So let's stay aware of the potentials, see what happens next, and then try to profit from it. 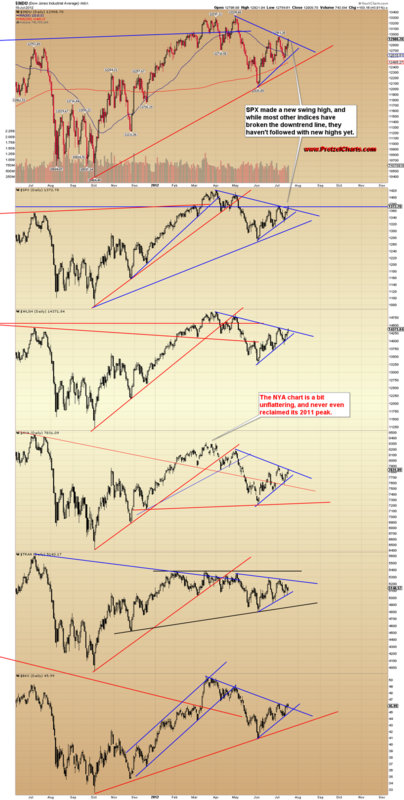 The first chart I'd like to share is interesting, and seems to cast some doubt on the current rally, while at the same time casting some doubt on the bear view. What should give the bulls pause is the narrowness of the rally: it currently isn't broad-based at all. What should give the bears pause are the numerous markets either breaking out from bullish basing patterns, or about to do so. 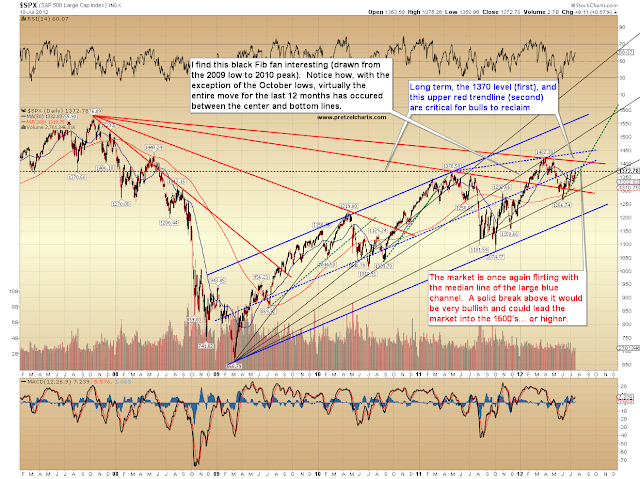 The second chart is the SPX daily, and shows the market again bouncing along the underside of the median channel line. Sustained trade above that line would be intermediate-term bullish. I have also labeled the 15 minute chart with the alternate bullish count. Note there is an interesting pattern that's formed here, and it provides what may be a critical clue -- it can be seen with the labels on the recent move: 1-2-3-4, and black i-ii. This is a third wave rally under any interpretation -- either C or (3) -- and if it's the bullish (3), then the third wave of the third wave should not be dying like this. In other words, the sub-minuette first wave (blue 1) probably shouldn't be longer than blue 3. The bullish i-ii nest (in black) would explain it -- the chart annotation at the bottom details this. 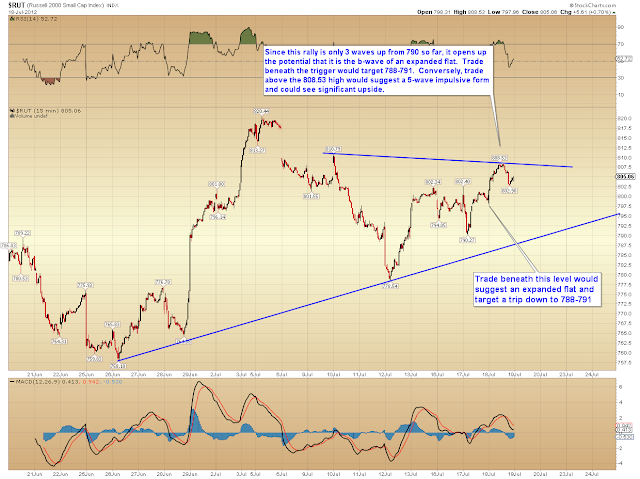 Finally, a simple short-term RUT chart that contains a note about the recent form of the rally and a trade trigger. In conclusion, the market has behaved largely as expected for the past month, so there's no reason for me to suddenly abandon the bear case here. But at the same time, I think we have to stay aware of the possibility that, with just a few shifts in the market, the tide could turn strongly in the bulls' favor. Trade safe. There's nothing quite like refreshing honesty and an objective perspective, and man... you provide both of those with flying colors. I know that you know why and how a major deflationary event seems like the only 'eventual' outcome, so it's doubly important that we be open minded until that day arrives. As you point out, it 'could' be nearly upon us. Some of my own work shows beyond any question that by some very long term measures the great unwind has already started. But they're very subtle (but undeniable) signals... early signals. Nonetheless, maybe the Orcs of New York will be able to delay the most obvious manifestation of a great deflationary decline (the stock markets) until the last moment. Who knows, that might be a year away? It's possible. So even though I have the disease, I'm more than open to your visions of a bullish outcome from here and won't hesitate to go long when I see what I personally need to see. I just wish I had that attitude 3 years ago. And no, I'm not afraid to go bullish "at the top", because if I go bullish, we're "not at the top yet", lol. Outstanding work buddy. All I can offer you is a great big "thank you"... again.